I was given a subscription to Family Tree Magazine for Christmas this past year. One issue had a listing of the Top 40 Genealogy Blogs. I decided to see what blogging for genealogy was all about and read a few of them. As I read the personal and family ones, a seed was planted-maybe I could write a blog about my family history. My daughter, Kirsten, is a social media guru. She gets paid to do this! Kirsten was my go-to person. I asked her what she thought and if I should or could do this. She was very supportive and encouraging. Kirsten continues to be the one I go to when I have questions, especially about photo's! She is the one who brings me down when I have a moment of panic, too. I wrote about 2 weeks worth of blogs before I made my presence known online. I found once I started the ideas just flowed. I continued to read other genealogist's blogs for inspiration. Today marks three months from when I went 'live' online. 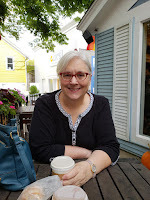 I started blogging because I wanted a way to share my research, photo's, and stories with family members. I wanted to have future generations discover my writings. Plus, I hoped to connect with other family members. What I didn't realize was what a wonderful community of bloggers I would come in contact with. I knew genealogists were some of the most generous people I have known. I have benefited from their generosity in ways I am not sure I will be able to repay. The contacts I have made through genealogy have touched me in ways I didn't think possible. I only hope I have been able to help others as I have been helped. I appreciate all the support I have received from other bloggers. I consider this blog a work in progress and each week I learn something new about blogging, usually from other bloggers! What a great community to be a part of. Thank You! In addition, I want to acknowledge the following people for their support and comments. Where would we be without comments? Brenda, Only three months? Boy, am I ever glad you came on board, look at all you've done to help me (newspaper article, cemetery stone photos, etc. ), goodness. Thank you for your stores and your help. You are welcome. Thanks for following my blog, too. Thank you for the shout out. I enjoy your blog so much. Happy 3-month blogiversary! Greta, that it's a lot of fun being a geneablogger! Amy, Greta and Bill Thank you for the kind words. Yes, it is fun and it is a great time to be a geneablogger. Luckie, I am the one who has been blessed by a great supportive geneablogger community. Thank You for your kind words. Plus, my daughter is a wonderful gift that I treasure for so many reasons. Aw. Thank you for the shout out as well! Your blog is fantastic! I can't believe how fabulous your blog got so fast. The geneablogger community is lucky to have you. Kirsten, I couldn't have done it without your help. Thank you so much. Thank you Brenda for the acknowledgement, that was so sweet. Your blog is wonderful, keep enjoying and posting! Looking forward to everything you have to share! Cheryl, Thank you for following my blog. It is bloggers like you that keep me going.